After thoroughly checking out our riverside campsite, we set out to find something to eat before heading to our appointment at the Hot Springs Resort & Spa's mineral baths. 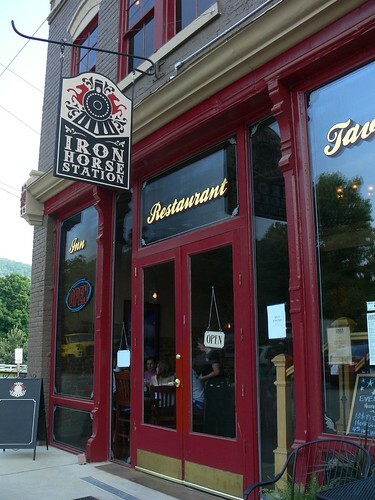 Based on a recommendation I found earlier, the Iron Horse Station was my first choice. We asked the campground attendant to point us in the right direction and headed that way, although he could have told us that it was within walking distance because right as we turned onto the main road, I could see the restaurant in plain sight. I mean, we could have thrown a rock at it from the campground entrance it was that close! 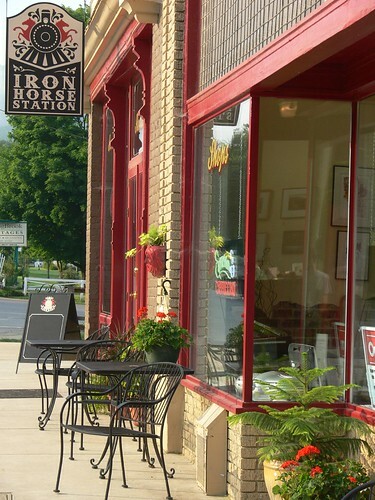 Formerly a haberdashery, the building that houses the Iron Horse Station restaurant is a beautifully restored relic of history, reportedly built prior to 1890. It had the most inviting atmoshpere. I absolutely loved the original exposed brick walls, reclaimed heart-of-pine hardwood flooring, and the stamped tin ceilings. It certainly had a lot of character. Too bad I can't say the same for the scattered host that sat us! To make a long story short: We put our name on a list, were told to come back in 20 minutes, he gave our seat to someone else who wasn't on the list, & he didn't bother mentioning that there was a lounge upstairs that we could have waited at, but despite all those short comings, he still managed to seat us. Thankfully, the amazingly juicy hamburgers & attentive waitress made up for the lack of service we received from the host. I ordered the Iron Horse 8oz. 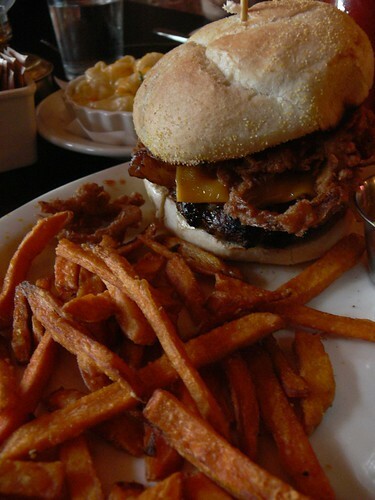 Burger with Crispy “Tobacco” Onions, Grilled Bacon, Cheddar Cheese, Grilled Tomato, Lettuce, Housemade BBQ Sauce and Mayo with a side of, my favorite, sweet potato fries. It was so big, I couldn't even finish the whole thing! We also ordered an extra side of the "Best Ever Mac & Cheese", which was a slight exaggeration as it was not worthy of the designated title, although salt helped (a little). Good thing that Cody and I are fast eaters because we barely finished with enough time to pay our tab and head over to the Hot Springs Resort & Spa for our 7:45 appointment, lucky for us, it was extremely close by! Because the town of Hot Springs has basically been frozen in time, you don't find the normal tourist traps here. They don't even have a stop light! There are only a handful of options to choose from when looking for places to eat, or if you're looking to get your morning jump start. On Sunday when we woke up, we took a walk around town so Cody could get his morning coffee. Apparently, 8:00 was a little too early for this town. No cars riding down the strip, no people walking along the sidewalks, it was a ghost town. Having the streets to ourselves, we strolled through town looking for an open establishment, but after numerous closed signs, we found ourselves back at the Iron Horse Station, but this time we went next door to 'the shop'. 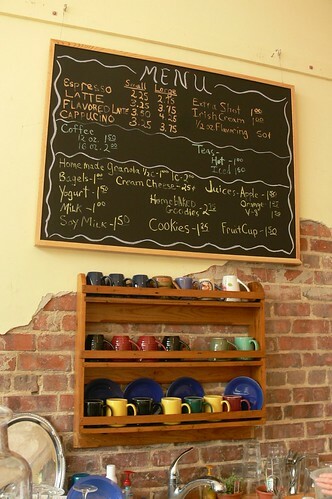 They had a very limited menu that mainly consisted of coffee drinks and a few lighter-fare breakfast items. We wanted something a little heavier so we only opted for Cody's espresso and a green tea for myself. At one point, we overheard the barista telling another patron about a breakfast place that was just down the street called, Smoky Mountain Diner. The rumbly in my tumbly prompted me to do the same! Apparently, we didn't walk far enough down main street when combing the strip earlier. After finishing up our drinks and saying our goodbyes, we headed that way. It was only a few blocks from where Cody and I turned back. We just couldn't see the sign from that distance. 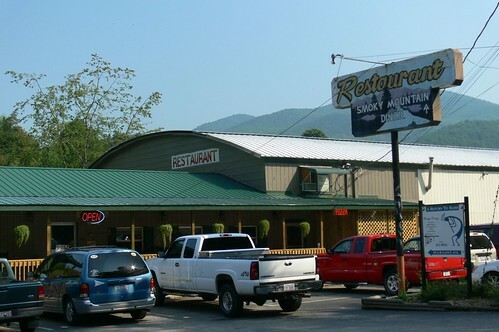 The Smoky Mountain Diner was your typical hole-in-the-wall greasy spoon eatery that offered a wide selection of breakfast items. The menu was huge! 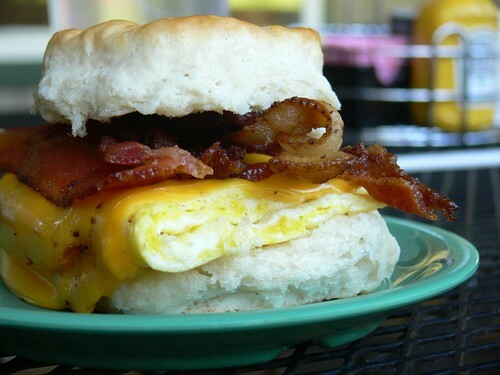 Instead of going crazy over what to order, I kept it simple and went with my usual bacon, egg and cheese biscuit while Cody ordered two biscuits smothered in gravy. The food was delicious!! Including tip we only paid about $10 for a quick and filling meal! My only complaint would be that they allow smoking in this restaurant and to get to the non-smoking section you have to walk through the billows of smoke. They do, however, have a nice patio out back that will get you away from it entirely which is where we ended up sitting. 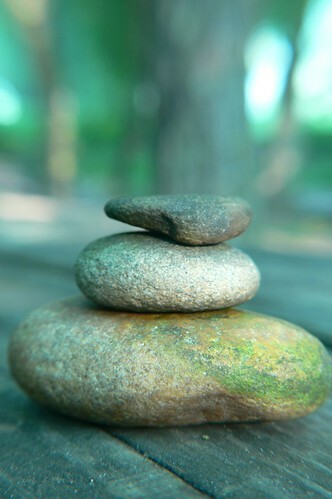 Bear with me, I still want to share our rejuvenating experience at the mineral baths. 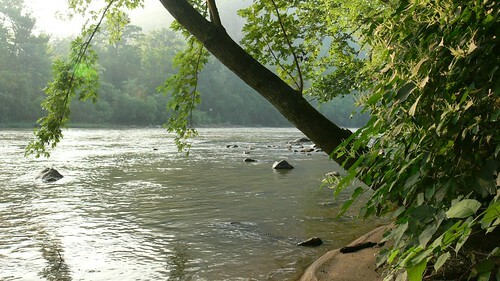 Coming soon: "The Best Way to Relax in Hot Springs, NC"
Address: 24 South Andrew Ave.
Did you miss "Riverside Camping in the Heart of Hot Springs?" If so, click here. We stitched our way through the borders of North Carolina and Tennessee while weaving and winding along scenic back country roads with endless pastoral views. Abandoned tobacco barns were plentiful in this region. The fields, however, filled with row after row of tobacco plants told a different tale than the facilities lying in disrepair would lead you to believe. I like them, the rundown ruins give the landscape special character. After many more twists, turns and tobacco barns, we finally reached the quaint little town of Hot Springs. The first order of business upon arrival was to check in to the Hot Springs campground, which happened to be one of the very first things you come to as you drive in to town, so we didn't get a chance to drive through and check the place out. 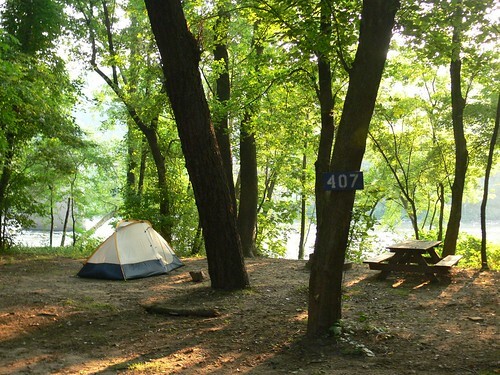 Armed with a parking pass and shoddy directions, we set out to find our riverside campsite. It was one of two that were still left when I called the day before! After a few bumps and turns later, we found our site tucked into a cul de sac of sorts. I felt as though we scored a perfect spot since it seemed a little more secluded--privacy is good, real good. 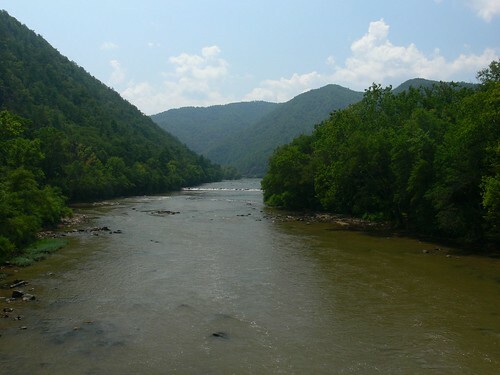 Upon stepping out of the car, the first thing you notice is the roaring French Broad River just footsteps away. It was a lot wider than I imagined it would be. In my mind, I pictured a babbling brook at our 'backdoor'. Instead, we were welcomed by a rather large expanse of semi-raging rapids (that may be a slight exaggeration)! A panorama of the bridge we crossed earlier dominated the view as we stood at the water's edge. We were also greeted with friendly waves from the floaters passing by. In a matter of 5 minutes we had seen numerous inner tubes, duckies, and even a canoe or two lazily moving along. It quickly became apparent that water recreation is very popular in this corner of NC. 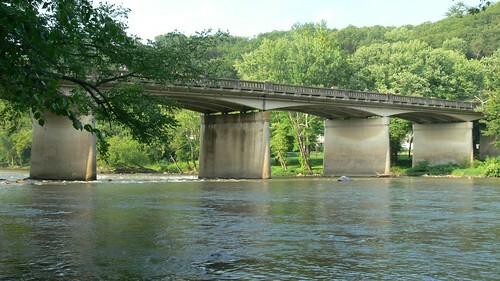 I wanted to go for a lazy float down the French Broad too, but due to time constraints we were forced to save the 5 hour tour for the next time we visit. I wasn't too sad since we had a 7:45pm reservation at the Hot Springs Resort & Spa to soak in a soothing mineral bath! But first, we had to get some grub! "Eating our Hearts out in Hot Springs, NC"
The Difference Between Delicious & Dangerous!! 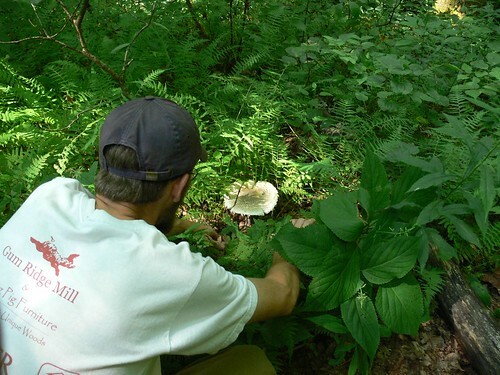 There is a fine line between delicious and dangerous when trying to determine whether or not a wild mushroom found on the forest floor is safe for the dinner table, or poisonous to consume. The latter being what you want to avoid at all costs because digesting unsafe fungi can cause serious illness, and in some cases, even death! Warnings, like the one above, can scare you from even considering such a thing as hunting mushrooms for fear of the unthinkable, but this is why it is wise to exercise extreme caution. There are a few varieties of edible mushrooms that can be recognized by simple characteristics, such as shape, size, and color. A few of which we learned about while bushwhacking through the ASU Woods a few weekends ago. Our main objective during this PACT hosted Edible Mushroom Tour with Dr. John Walker, an ASU Biologist, who specializes in Mycology (The study of fungi), was to seek out the shrooms and learn identification techniques with the help of a professional guide. I expected that during the duration of these explanations I would hear a ton of words that I hadn't ever heard before--and I did. It was almost like listening to someone speak a foreign language! 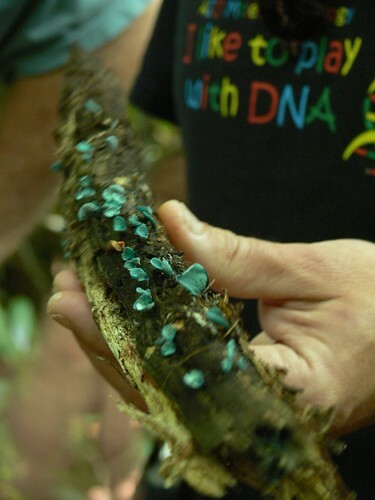 One quick and basic rule of thumb that I thoroughly understood, though, was to completely avoid all fungi that had gills. 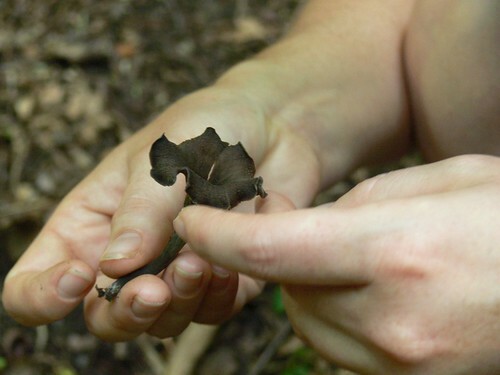 While there may be some that are safe to consume, it is still extremely difficult to identify them. Even a highly trained instructor is hesitant to eat from that category. Not something you want to take a chance with. 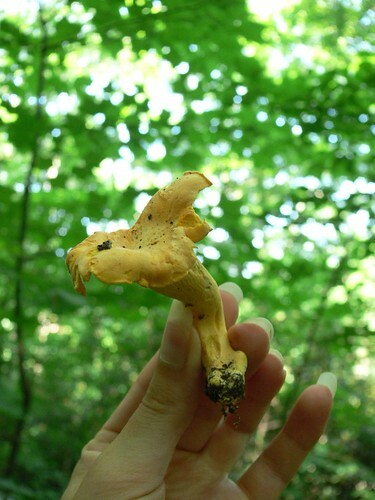 During our trudge through the forest, we encountered many different varieties of mushrooms. While they are all pretty too look at, I now know what to steer clear of, as well as a few tasty treats we could take home should we get lucky enough to come across them again. 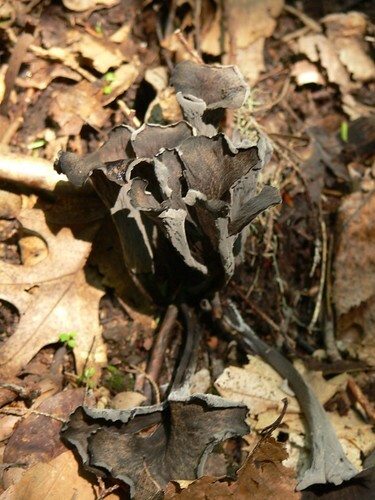 We did, however, have the very good fortune of accidentally stumbling upon a patch of Black Trumpets when trying to find our way back to the trail. I actually feel a lot more confident about deeming certain delectables safe since attending this foray. I don't want to get into the technical verification 'tests' involved here on WW because I don't feel qualified to provide you with the proper information, but if you're interested in learning more, the info is plentiful. Whether you find a local specialist who might enjoy giving a tour in your hometown, or you dig into a comprehensive guide book to sharpen your skills, be sure that you do your homework before "testing the waters." You can start by doing some research on what you could expect to find based on your geographical location. 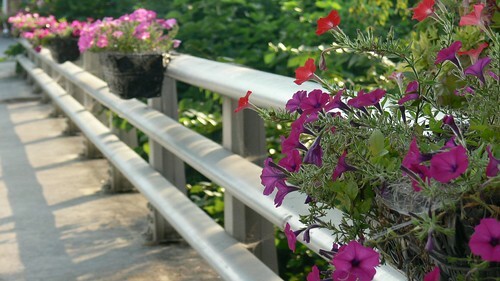 Look for, not only those that are edible, but others to avoid, as well as possibly poisonous lookalikes. 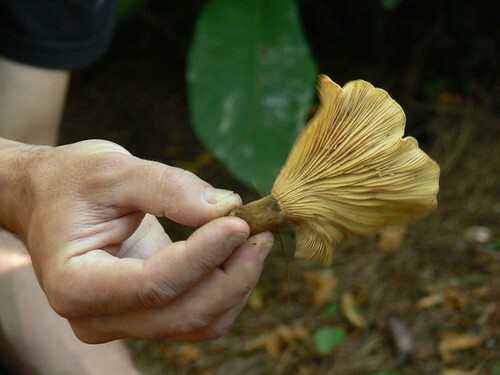 One thing we didn't touch base on too much were spore prints, which is supposed to be another great way for the less experienced to identify edible wild mushrooms. Yes, there are risks involved, but you just have to be aware and well informed to remain on the safe side. 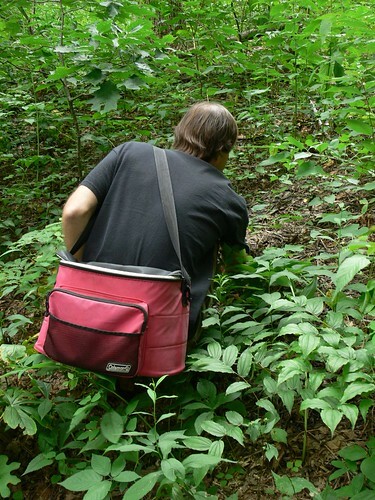 Even if you only head out with the intention of admiring and/or photographing them, think about going on your own mushroom hunting expedition once armed with new knowledge. I promise that you will make all sorts of interesting discoveries when you are closely paying attention to those often overlooked details!